It's the Rewind edition of Fashionable Friday. I've gotten some really awesome comments that last few weeks and wanted to bring some of them front and center and reply. 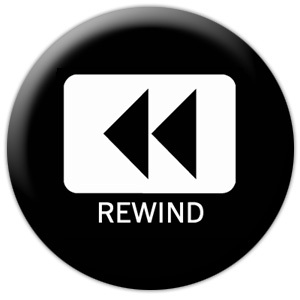 So sit back, relax and let the rewind begin. When I deemed Fridays, Fashionable Friday on my blog Jill from Glamamom said that sometimes all it takes to feeling confident in the way you look is a little lipstick and a pair of earrings. And she's right. Even when you don't have time to perfect your hair or put on that just right outfit, sometimes just curling the eyelashes (#1 must have accessory) and adding lipstick and those perfect earrings can help. I know for a fact that freshening up my daily mommy face to go out makes me look 100 times better. Try it...you too will be surprised. And speaking of hair when I did talked about my hair issues and Elizabeth from The Writer Revived mentioned how she needed to cut her hair shorter to stay away from the dreaded ponytail. When my hair is curly...it's pulled in a ponytail after a long day. If I straighten my hair? Yep, still a ponytail. So what about you? Do you have the prefect compromise? Do you think keeping hair a certain length prevents you from either styling it or not styling it? I love how long my hair is now and when I think about cutting it I just can't do it. So for me...it's ponytail or bust. And of course no talk about fashion is complete without talking about shoes. As much as we as women love shoes, we still have issues once we become mom, it's hard to get out of what's comfortable and quick. Then came the two post about doing you,part 1 and part 2. And the first comment that popped out at me was from Carolyn over at This Talk Ain't Cheap. She divulged her age and said she was dressing better now than she ever did before. She has 3 beautiful daughters and feels the image she portrays to them is important. She doesn't feel the need to "mom jean" it but still wants to look fresh, hip and young. And she's right. Just because we become moms and our bodies change doesn't mean we can't continue to look good. Maybe we aren't wearing the same sizes but we need to know it's okay to accept our new sizes. For me? I've realized that 100 pounds was good for my 20's but it just won't work now and that's I accept that. I can still look hip and fresh and young. And yes, some days I look better now than I ever did in my 20's! Part two I gave away my secret weapon for looking instantly thinner...a goodgreat bra. All my nursing mommies out there quickly chimed in on how it is just easier to grab a bra from the local store and go with it. And there is nothing wrong with that but my advice is to make sure you are truly wearing the right size. It will make a difference...even if it's snappy nursing bra. Last week I talked about the holy grail of fashion, jeans! And boy was I schooled...that's right almost everyone that chimed in let me know that YES, designer jeans are worth the splurge. Who knew? I have yet to put my rear end a pair but plan on trying some as soon as I have baby #2 and lose the baby weight. So there you have it, a rewind of all the fashion talk that's been going on...and what you've been missing! So stick around and chime in and be fashionable. After all, it's only one day a week. OMG, YES designer jeans are worth the splurge! Thankfully, we have lots of outlets in Orlando to score some really great brands at very low prices!